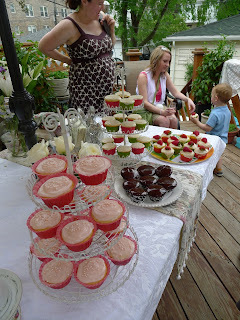 As many of you may know, I have been busy throwing my first bridal shower for a close friend and coworker of mine. I hosted it with another close friend, which helped with the overall costs. The bride to be is a girly-girl, who likes cupcakes and vintage chic mixed with modern style (think Anthropologie). SO we decided to theme the party in a vintage, garden party style. 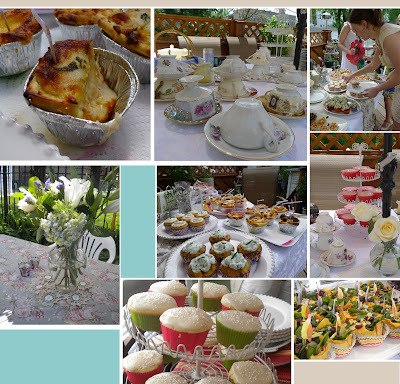 We served sweet and savory cupcakes, teas and crisp refreshments on real china outside in my garden and on my deck. Here are some ideas based on what we did, in case you want to throw something similar. This approach would be a fun summer picnic, a great birthday party, casual wedding or Sunday brunch. 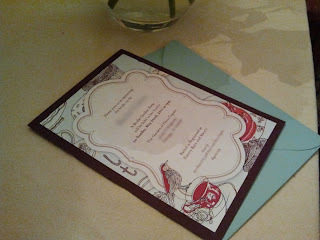 We kept in the floral theme, and being art directors by trade, my co-hostess designed a beautiful invite using paper from The PaperSource and stock illustration from Shutterstock. The bird on the tea cup was what gave us the idea for serving tea, just like Victorian garden parties of yore. We brought in the bride's aqua and earth tones to fit her wedding day colors. Making invitations is more affordable while still feeling very custom. Well, it is a garden party, after all. And having it at someone's home saves a lot of money. So we had it in my garden. My main goal was to have the garden looking it's best by the time the party came around. The best way to do this on a budget is to ferret out the best places to buy plants. I had to purchase a lot of annuals this year for the garden, because the party was in early spring. Many of my flowers were not open yet. To get the color and ambiance we needed, I had to put in annuals in the garden beds, as well as fill pots all over the deck with color. Pots can also be found at many thrift stores. Get creative! I picked up some pretty nice pots that I think may have been fancy garbage cans. I just poked holes in the bottom with a nail and a hammer, and TA DA! Instant pretty pot for 2 dollars! Thrift stores are also great for finding unique plant stands and small accent tables, if you are lucky. You can always spray paint them the color you want and give them a second life. At 3 dollars each, even if it is a small indoor table, you won't feel bad putting it outside in the elements for a few years on the deck. No garden you say? Or its winter? No problem. Have it inside! Get many pots and vases from the thrift store and disinfect them. Then purchase many flowers at the club stores on online for even cheaper and fill the inside party area with flowers to get the feel. Once you add the textiles and vintage glassware with it, it will feel just like a garden in no time! Also, if your budget allows, you can look at renting space in a local botanical garden or museum, or even a park district. So the key here was to look and feel like Anthropologie without spending that kind of coin. This takes a little more effort and running around, but I think what we ended up with was much more special and unique. First we needed mismatched, vintage tea cups and saucers that looked like they came from Grandma's attic. We also needed china plates, and silverware, which I happened to have (half from an estate sale years ago and half from my mom's old wedding china). The tea cups we found ranging from 49 cents a saucer to 5-10 dollars for a set, all at Salvation Army and Unique Thrift stores. Some hot water and anti-bacterial soap, and they were good to go! Also, we found a hand painted, footed bowl (used as an ice bucket.) with matching little cups (that we used to decorate the tables-could be filled with tea lights or snacks). Next we needed lots of flowery, lace fabrics, table runners and tablecloths. JoAnne Fabric and Crafts helped us there, as well as the thrift stores again. Tablecloths were 3-5 dollars at Unique Thrift store. I even found a Victorian styled bed sheet that after washed in a hot water cycle, looked beautiful draped over a folding table. I just layered fabrics, runners and lace here and there at the food table, the beverage area, the gift table and on the eating tables. 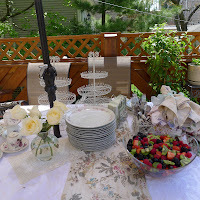 I also draped a few yards of lace around the deck to dress it up, cinched with the aqua ribbon color to fit the theme. The key is to sort of stay with a color theme here (here we used aquas, beiges, whites, faded pinks), even though you are mixing patterns and textures. And it is good to have some neutrals here as well, like under the food table for instance. We had such a mix of patterns on the china and napkins, that a damask white under all of it with a vintage runner and some white lace doilies for texture was all that table needed. Serving Accents were next. We knew we were serving cupcakes, so we were able to buy two tiered white wired cupcake stands for 12 dollars each at World Market. We bought a slew of affordable floral napkins in an array of patterns to supplement the ones I already had, giving a bright and festive air to the table. We tied them with aqua blue organza ribbon (from JoAnne's) for guests. We also purchased a utensil organizer in the same style as the tiered stands for a song. World Market is a very affordable place to get things for a party in the style you are looking for. 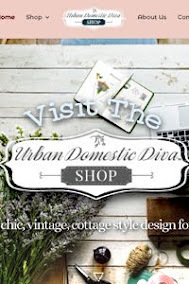 We got a few things to just tie the shabby chic look together without spending too much. And to that end, my favorite thing we scored on sale were two glass decanters on wire stands. These gave the party a vintage garden party feel filled with ice and refreshing libations! And the final accent was more flowers. Flowers can get expensive. We found the most affordable route when you have to buy a lot is to go to a club store, like CostCo. They are great quality and you can fill various sized vases to put near the food, in the bathroom, at the beverage table...pretty much anywhere! I also felt that my garden gate needed a wreath for when you walk in. I purchased a large one on sale at JoAnne Fabrics, and bought a wide aqua ribbon and used more of the organza to decorate it and tie it to my garden gate. This way when guests came down the garden path to the garden gate, they felt welcome and got a sense of what the party theme and color was about. I also wove some scrap organza I found in some bric-a-brac bags at the thrift store for 99 cents on the top of the gate to make it feel a little formal. Many thrift stores have bags of this and that for really cheap. I purchased a couple of these for the scraps of fabric and ribbon inside for the "hat activity" and for what I could throw here or there for flair. For the food, like I mentioned, we made the party about cupcakes, but really any finger food will do. In fact, you can have a whole Victorian tea theme with finger sandwiches, salads and petite fours! Whatever you do, you want to keep things light, fun and easy for an outdoor party. I will be posting recipes in the next few weeks of many of the following, but feel free to get creative and do your own thing! For libations, the decanters just looked lovely with chilled ice water in one, and a Raspberry Beer Vodka lemonade in the other. My co-hostess also purchased an array of white Cupcake wines from World Market which we had chilling in a bucket. And of course, we had hot water in an electric kettle plugged into the outdoor outlet on the deck, with various teas and Starbuck's VIAs for people to sip in their pretty little cup of choice. 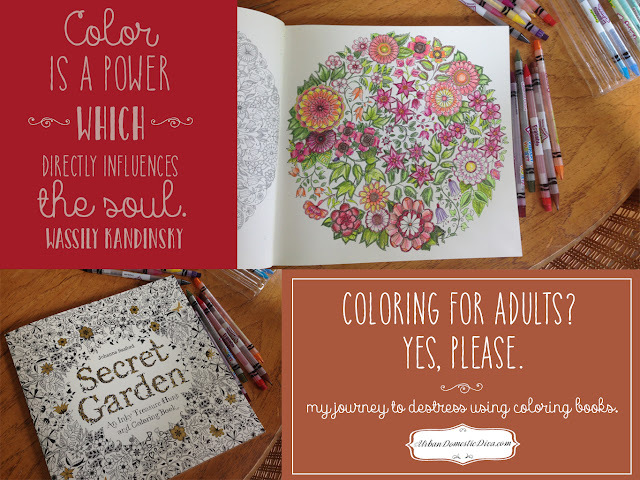 Other than the typical shower activities, we wanted to do something fun and special. And as one of my guests pointed out, "All we need are garden hats!" 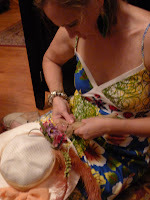 To which I replied, "Well, speaking of that..." and I showed her our table for garden hat making! This is where you need a really good thrift store and a huge bottle of vanilla lavender Lysol to make this activity fun and affordable. Buy a slew of second hand hats at the thrift store, as well as the bags of bric-a-brac with ribbons, tulle and fabric scraps for 99 cents each. I also purchased a variety of second hand scarves and kerchiefs for 45 cents a piece. I then purchased ribbons on sale at Joanne's, silk flowers and feathers on sale and some tacky glue. Glue guns are also very good for this activity. I laid everything out in different baskets so guests can find everything easily and get creative. Then we had to wear them for the bride and she chose a first and second place. It broke up the day and everyone could be creative and have fun... and keep the hat as a gift. As a thank you for coming to the party, we let each guest choose a china cup for them to take home. We rinsed them out during the gift opening, and filled them with an organza bag of truffles, complete with a thank you tag. The bags were from JoAnn's in packages in 10, and the Lindor Truffles we found at World Market. The tag was designed to match the invitations. So all in all it was a beautiful day. Everyone had a fun time, the bride was elated, the food was fantastic! 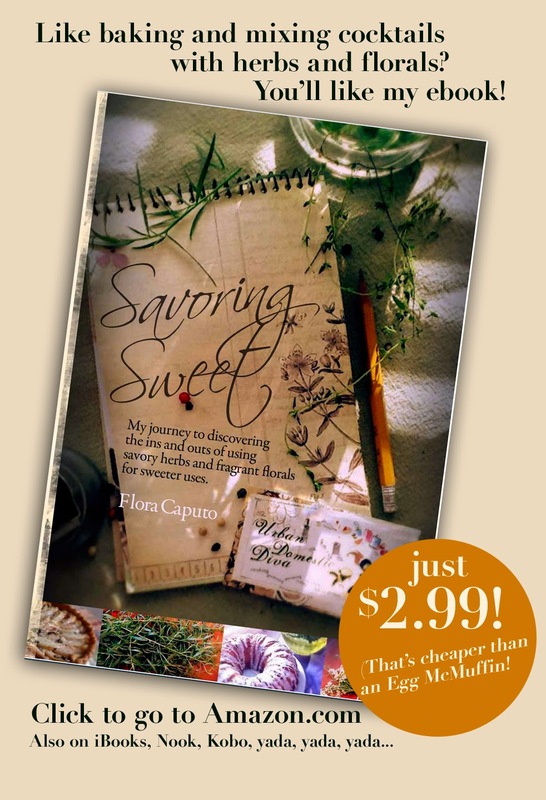 Stop by over the next few weeks and I will share some of the recipes with you.